Your time is valuable - Let us do the hard work! We know running a successful advertising campaign for small & medium business can be tough. Ad creation, keyword selection and account setup on different search engines is complicated, time consuming and often requires training to learn. 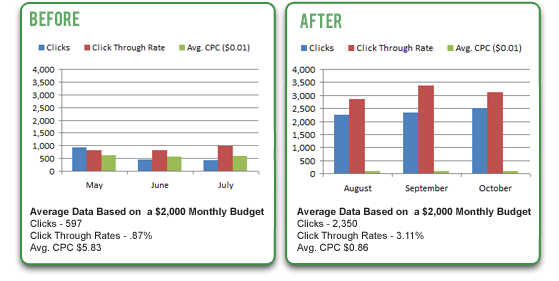 Aside from this, you also need to constantly monitor and optimize your campaign in order to maintain a high quality score and keep your click costs down. OpenVision hasdone a great job for my company! I found out about them in June 09 and allowed them to handle my SEO work and then my ppc campaigns, with some reservations. I thought I was doing a great job with the ppc's on my own, but after allowing them to take it over for only 1 month, i saw a 650% increase in the number of clicks to my website and have had a record number of visitors to my site since! I have been so impressed with their services that I have allowed them to re-develop my entire website! The OpenVision team have done a great job for me. *Now, for a limited time, OpenVision is offering a free PPC Review/Audit to qualifying respondents that sign up in the next 30 days.